You may have entire teams of Level 100, max IV monsters in Pokemon Let’s Go Pikachu and Eevee, but are they shiny? If not, why not? Shiny Pokemon are just like their regular counterparts except they’re, well, shiny. Rather than taking on a metallic glint, these special Pokemon are color-swapped. For instance, shiny Cubone is green. Green isn’t exactly shiny, but green Cubone is still shiny Cubone. These creatures are far more rare – and so far more coveted. Anyway, Pokemon Let’s Go has completely reinvented shiny hunting because the game actually addresses it as a thing. The Shiny Charm that the Game Director in Celadon City gives you after you complete the Pokedex attests to this – it is designed to increase your chances of encountering a shiny Pokemon in the wild. 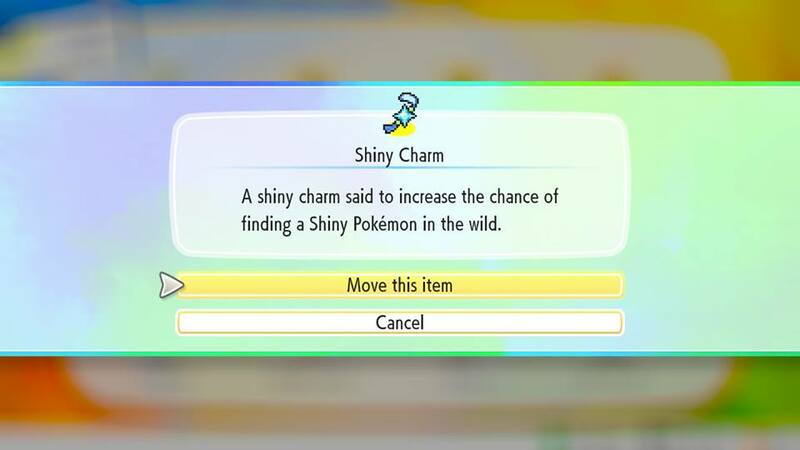 While shinies have always been available, Nintendo has finally decided to come out and say, “Here’s a thing for you shiny hunters.” However, the Shiny Charm isn’t the only thing you can use to better your chances of encountering shinies. After you complete your Pokedex (which isn’t as hard as it sounds) you can visit the Game Director in Celadon City. There’s a man with a buff Poliwrath standing outside the building you’re looking for. Head in and you’ll find a floor with the in-game Game Freak team. The Director is wearing casual clothes because he’s a proper dude. Chat to him and he’ll commend you for catching ‘em all. He’ll give you a neat certificate and the Shiny Charm, which you never have to do anything with. Just keep it in your bag and it will work on its own, increasing the odds of encountering a shiny from 1 in 4,096 to 1 in 1,365. Don’t sell it or it’s gone. Selling it would be very silly. I was only checking to see how much it was worth, alright? Lures are something that people use wrong all the time. Think of Pokemon Go: your drop a Lure at a PokeStop and wait for the Pokemon to come to you, don’t you? Running around like a maniac just uses up the Lure. While you’ll encounter more Pokemon in a shorter period of time, you’ll burn through Lures like someone addicted to grapes burns through pants. Also, lots of Pokemon will spawn behind you after your trailblazing trajectory has already left them for dust. What if they’re your shiny? Drop a Lure and be patient. If you’re in a confined area like a cave, only move to dodge Pokemon that are annoying you. As well as being an effective shiny hunting method, this will teach you patience. The exceptions to this are surfing and flying. Unless you find a nice, narrow cove (I’m going to suggest one in a minute, hang on) then you’re better off actually moving with your lure on. The whole body of water is a spawn area, unlike patches of grass that are located beside paths. You’ll find loads more Pokemon this way. Well worth the Lure. When you’re flying, you can actually do some interesting things in relation to what I’m about to get to next. 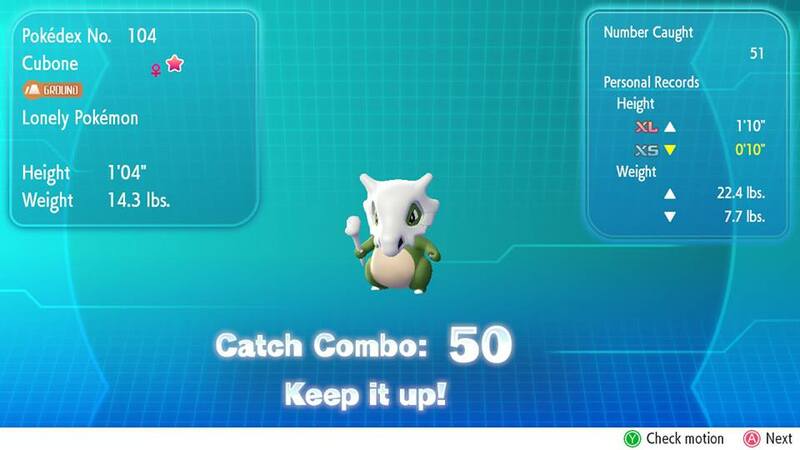 Catch combos are a new feature in Pokemon Let’s Go that reward you for monotonously catching the same Pokemon over and over again. 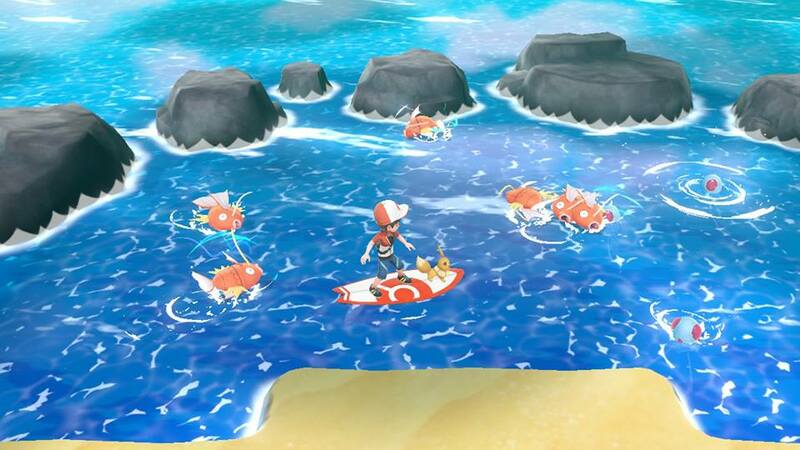 For instance, if you catch 10 lovely Magikarps in a row, you’ll have a 10 Magikarp combo. The good thing about this is that catch combos actually serve a purpose. We’ve got a full page all about catch combos and how they work. The odds of encountering a shiny increase at combos of 11x, 21x, and 31x, with the last one increasing the odds of encountering a shiny to roughly 1 in 273 if used with the methods mentioned above. Lots of people are going for catch combos of 150+, but that’s a bit pointless, really, because the odds increase caps at 31x. I could send you on your way now that you have the information required for maximum shiny odds, but I’m going to provide an example I used last night that netted me two shinies within four minutes of achieving max odds. Any combo works for all Pokemon. What I mean is, if you’re on a 31x catch combo of Pidgeys, you still have a 1 in 273 chance of encountering a shiny Dragonite. With that in mind, don’t waste a million Ultra Balls on things that are hard to catch. Ultra Balls are for Tories. If a Pokemon runs away from you, your combo will reset. A Pokemon will never run until you’ve thrown at least two Poke Balls, so catching rare Pokemon that have an orange or red ring is less than ideal. Being able to catch Magikarp with one Poke Ball, or two if needs be, means that you can be cheap and keep your combo safe. Combos only reset if the Pokemon runs away, you catch a different Pokemon, or you turn the game off (standby mode retains your combo, by the way). Running into other Pokemon is fine once you don’t catch them and you can leave the map as often as you like. Trainer battles also have no impact on the combo, so battle to your heart’s content. Anyway, once you’ve built a 31x Magikarp combo from (hopefully) 31 Poke Balls, you’ll have max shiny odds for $6,200. If you went for rarer Pokemon, averaged two Ultra Balls for every capture and used, let’s say six Super Lures, you’d have spent $36,200. I’ve just saved you 30 grand. You should probably get a shiny Magikarp first, as this won’t reset your combo considering it is also a Magikarp. It’s just a golden one that’s going to evolve into a wonderful Red Gyarados someday. This works with other easy-to-catch critters, too, such as Caterpie, Weedle, and Pidgey. I like catching Magikarp, though, because their cry makes me laugh and their pathetic little faces are lovely. Now that you have your 31x combo and (hopefully) a shiny Magikarp, it’s time to go shiny hunting for real. If you’re in a cave or you’re surfing, just do what’s already mentioned above. If you’re flying or hunting in long grass, though, this is what you should do. After you beat the Elite Four, you’ll unlock a new flying ability for Aerodactyl, Charizard, and Dragonite. Instead of hovering just above the ground, they’ll take to the skies above and grant you a bird’s-eye view of the grass below. Hover over the long grass and wait for four or five Pokemon to spawn. No shinies? Go off-screen, preferably to a fresh patch, and wait a few seconds. Four or five Pokemon should spawn. Still no shinies? Go back to the first patch, where all of the Pokemon will have de-spawned, allowing yet another four or five to spawn. Rinsing and repeating this allows you to encounter lots of Pokemon without using up your Lure in seven seconds, as you’re not actually moving that much. This is the absolute best way of shiny hunting, as it is quick, cost-effective, and not half as soul-destroying as falling asleep from watching the same screen for two hours. Last night, I caught 31 Cubones, then ran into a cheeky green bonehead, caught him, then flew to Celadon for the craic. Two minutes later, I ran into a Ponyta with a mane of blue flames. Caught that, too. Now I have a green Marowak and a massive horse covered in blue fire. It’s brilliant. Shiny hunting in Pokemon Let’s Go is actually a lot of fun. The catch combos increase the stats of the Pokemon you catch, too, as a 31x combo will ensure that a Pokemon has stats that are at least “great”. One of the rubbish bits about previous games was that your shiny could end up hitting like a wet tissue. That’s not the case in Let’s Go, so your shiny Charizard is likely going to be an absolute tank. It just might take you seven years to get him – or it least it would, if not for this amazing guide.